Concerns about Kansas remain, but all the Jayhawks needed to put the Silvio De Sousa news and Marcus Garrett‘s injury behind them was a home game. 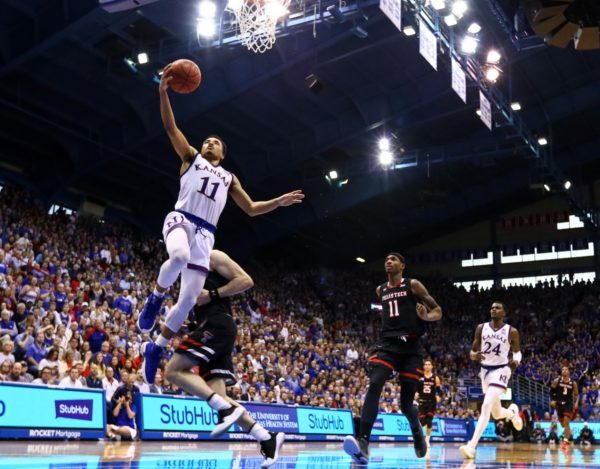 As it has for decades, a return to Allen Fieldhouse provided a respite as the Jayhawks blew out Texas Tech on Saturday. The Red Raiders missing 80 percent of their three-pointers accelerated the outcome, but yet again, Bill Self made the necessary adjustments to enable the Jayhawks to log their best three-point shooting performance in nearly three weeks. While Baylor, Kansas State and Iowa State also won their games to stay ahead of Kansas in the league standings, in my mind, the notion of The Streak coming to an end will not merit serious discussion until Self’s club is two or more games back of the leaders with five remaining. Baylor’s 90-64 victory over TCU on Saturday was big for a few reasons. As former contributor and friend of RTC Kendall Kaut noted, it marked the biggest loss by final margin of Jamie Dixon‘s career as a head coach at either Pittsburgh or TCU. It also kept the Bears in first place, and a 40-point, 9-of-12 from distance showcase from Makai Mason in that game would make even former Brady Heslip turn red. Seriously. Look where some of these shots came from. The win pushed Baylor’s Big 12 winning streak to five games, marking just the third time the Bears have accomplished such a feat. Six league wins in a row has proven elusive for Scott Drew to this point (exempting a couple cases where the sixth win came in the Big 12 Tournament), but the Bears will have a good chance to reach that apex on Wednesday night against Texas. Looking forward, it remains anyone’s guess how long they can stay hot (40.2% 3FG) from distance. This season has been massive for Baylor in that an NCAA Tournament bid seems like a formality just a few months after being picked to finish ninth in the league, but don’t be surprised to see some regression as the schedule toughens on the Bears down the stretch. It’s tough to overestimate the importance of the next four games for Kansas State. The Wildcats sit atop the league standings at the moment, but the pressure cooker of facing their intrastate rival looms Tuesday before they travel to Baylor and Texas and rounding out with a home date versus Iowa State. All four upcoming opponents rank among the league’s top five offensive units, so while the Big 12 hasn’t made scoring look pretty this season, its best defense is going to have its hands full. The schedule lets up after this stretch, so if Bruce Weber‘s club can enter its February 16 match-up against West Virginia having only taken one more loss, the Wildcats will be in great shape for the final push. It hasn’t always looked as glamorous as Fred Hoiberg made it look in Ames, but Steve Prohm has kept Iowa State‘s offense operating at a high level against tough competition. The Cyclones lose some toughness points for conceding the offensive glass and shying away from contact despite shooting a team-wide 75 percent from the free throw line, but it counts all the same in the end. Iowa State’s defense is also getting the job done more often than not, and its three conference losses have come by just eight points. It felt like a lot of the national attention garnered from the Cyclones’ big win over Kansas a few weeks ago frittered away after they dropped their next two games, but they’ve since won five of six, with the only loss in that stretch coming in the return trip at Kansas. The Cyclones are also one of just just six teams that currently rank among the top 20 in both offensive and defensive efficiency — with the others being Duke, Virginia, Michigan State, North Carolina and Kentucky — so they’re among elite company. This entry was posted on Monday, February 4th, 2019 at 3:01 pm by Brian Goodman	and is filed under big 12, feature, microsites. . You can follow any responses to this entry through the RSS 2.0 feed. You can leave a response, or trackback from your own site.